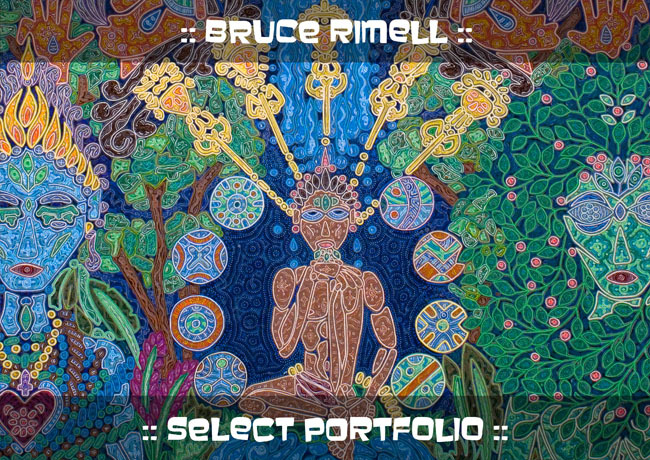 Bruce Rimell is an internationally-exhibited visual artist, poet and independent researcher, based in Leeds-Bradford in the UK, who works principally with visionary, ethnographic, archaeological and cognitive themes. His vibrant imagery springs from the confluence of personal visionary experiences since childhood, shimmering inner sensations of archaeological prehistories, the humanist interplay of the cognitive and ethnographic, and dynamics of the queer and the mythical. His art occupies a liminal space somewhere between painting, drawing and illustration, with holistic imagery springing from smooth moving lines, fragmented anatomies and vivid stylised forms. The Dual Image Medium – in which one image rendered in acrylics, inks and markers is seen by daylight and another, different painted image is seen on the same canvas under ultraviolet illumination – is a unique and increasingly central aspect of his practice. These disparate elements are imagistically combined towards a single artistic aim: Beyond-The-Self Exploration. Multiple themes are enfolded to create a sense of experiential depth and hyperactive visual engagement, while abstract commentaries and critical positions are abandoned in pursuit of the simultaneously disquieting yet intimately familiar foundational currents within the living, paradoxical and sacred human being. Come and look beyond. What do you find? Information for Galleries, and Arts and Media Organisations can be found by clicking HERE on the image at left. Three PDF documents are available: i) a Select Portfolio for galleries and arts organisations, ii) a Magazine article for media, and iii) detailed background information on my uniqueDual Image Medium. In July 2017, I issued a short statement about the future direction of my art and research, which included no longer referring to myself as a 'visionary artist', a self-designation from which I have become increasingly distant for a number of years. This statement is accessible HERE. Cupola Gallery, Sheffield, UK Ten years of representation in this gallery of contemporary art! Visionaries: Seers of the Soul, NY, USA ‘The Dream Of Bellerophon’ and other works featured.